Cherry Mobile Flare HD 2.0 Now Official, Priced At 2999 Pesos! Home / cherry mobile / mobile / news / Cherry Mobile Flare HD 2.0 Now Official, Priced At 2999 Pesos! Last month, we reported that Cherry Mobile's HD 2.0 was spotted on sale at SM Light Mall. Now, the number 1 smartphone brand in the Philippines has officially announced that the said handset is now available nationwide. As a recap, the Cherry Mobile Flare HD 2.0 is a stylish budget phone with capable configurations. It boast a 5 inch HD IPS screen, 1.3 GHz MT6580 chip, 1 GB RAM, 8 GB expandable ROM, 2,200 mAh battery, 8 MP main cam, and 5 MP selfie cam. It runs with Android 5.1 Lollipop OS. 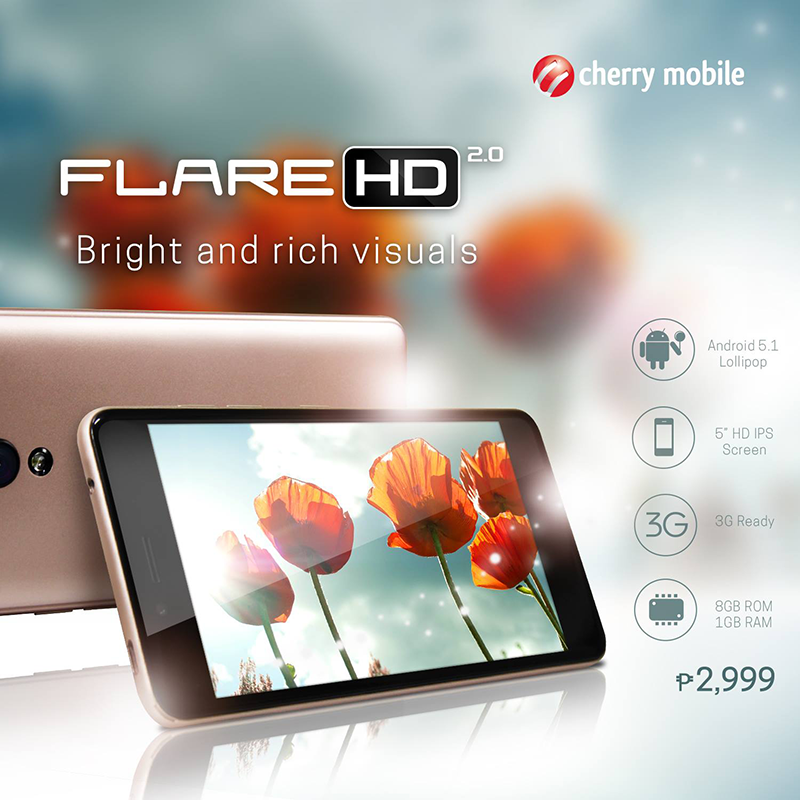 The Cherry Mobile Flare HD 2.0 is priced at 2,999 Pesos only.